Wish you were here! Have a wonderful no-Labor day everyone! I was pulling out yellow and brown foliage from some Happy Returns daylilies, when I found this: Three daylily scapes fused together. Daylilies have been grown in every garden I've ever had, and I've never seen this happen before. Have you? The blooms are perfectly normal. Brenda at The Brenda Blog came up with a fun idea. She invited bloggers to post pictures of their personal blogging spaces. You can read more about her great idea here, as well as in subsequent posts on her blog during the past week. I'm a little late to the party. For the past couple of weeks we've been having daily internet outages lasting most of each day. It's been a frustrating couple of weeks posting and keeping up with blog reading. I called our internet provider yesterday. They were out here by afternoon and fixed the problem. When does that ever happen? This desk has been with me since my kids were small and we got our first computer. It's been through a divorce, a move, an empty nest, a new marriage, the move here, George's separation anxiety. . . (He gouged the heck out it one day during a period of extreme separation anxiety after being boarded for the first time.) Like me, the desk has survived it all with just a few minor scars. This is a pretty big house, and we have the luxury of an office; actually, two of them. This one we share. There's another upstairs that's all his. This is my husband's side of our shared office. Whaddaya think of that big honkin' monitor! He offered to get me one like that too, but the one I have is just fine for me, and fits well in its space. I might need one like that if my eyesight keeps going in the direction it's been the last few years. (He's got better eyesight than me, he just likes the big screen.) It's not a tiny office, and it's not huge either. It's big enough though. Below is a computer cabinet my husband gave me. It makes a perfect sewing cabinet. (The sewing machine was a gift too.) The top flips up, back, and out of the way, the sewing machine slides out on the keyboard tray, and there's plenty room for knees. The two bottom drawers are quite roomy, and hold a lot of stuff. Everything closes up, so all that stuff is neatly out of sight. (I'm a bit of a neat freak.) The stuff on the chair is camera stuff - tripod case, camera cases, all new stuff my generous husband recently bought for me. I could go around the room and point out many things he's gifted me with. Generous as he is though, he's also a pretty unassuming guy, and I wouldn't want to make him feel uneasy. Lets just say he's been very $upportive of my interests, and leave it at that. I hope you enjoyed the tour. 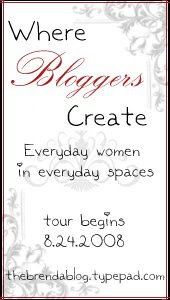 Please visit Brenda and check out her creative space, as well as links to other bloggers participating in this fun cyber event! The rain predicted here the last couple of days has danced around us, not on us. July and August are the months I sometimes have to sprinkle. Mother nature has been kind to us in the summer weather and rain departments most of this season. Although it's not terribly hot so far today, even 83 degrees can feel quite uncomfortable on a dog day with high humidity. It's beautiful and mostly shady in the garden this morning, and everything received a refreshing drink of water. The elephant ears in the background have been windblown the last couple of days. It's well hydrated, but sometimes folds itself down to protect its huge leaves from the wind's assault. Sometimes it takes a couple of days to recover. So far it always has. The containers in front were watered with the proceeds from the basement dehumidifier. They seem to like the water, and it's a small way among others I conserve water around here. I take short showers and turn down the water pressure quite a bit on our very generous shower head, doing my best to convince myself it helps compensate for those times when I have to resort to the sprinkler. I've planted drought-tolerant plants together, and those few with higher watering needs close to the patio. I've moved most of the containers into the garden so the runoff from watering them benefits the garden instead of evaporating on the patio. I put the watering can under the fuchsia - the only hanging basket that isn't hanging over the garden, so I can collect and reuse the runoff. I do my best in every way possible to reduce water usage and ease those pangs I feel when I turn on the sprinkler. Rain barrels and soaker hoses are up there on a list of additional measures. There's a spot in one corner of our patio where, for a moment most sunny mornings, spider webs are perfectly illuminated by the sun. This was one such morning. It's always a brief moment, and I often watch as the illumination reaches its crescendo then fades away, and the webs disappear into the air. 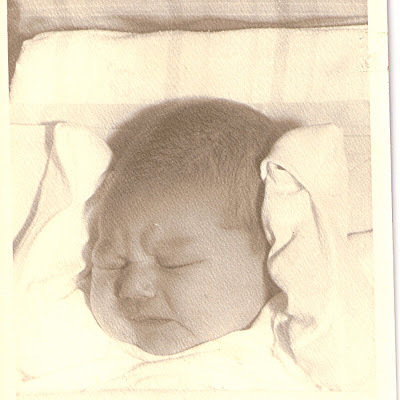 She was born two weeks late during one of the hottest Chicago summers on record. 4-1/2 hours of labor, 9 pounds, 2 ounces, 22 inches long. Summer's flying by, and I can hardly believe it's already mid-August. Carol at May Dreams Gardens invites garden bloggers everywhere to share what's blooming in our gardens on the 15th of each month. Thanks for visiting, and I hope you enjoy the blooms! Hosta 'Stained Glass' has a large, delightfully fragrant, white-with-pale-purple-stripes bloom. I love everything about this hosta. The Surprise Lilies, a/k/a Naked Ladies (Lycoris squamigera) just popped up four days ago, and are already blooming. Echinacea purpurea 'Ruby Giant' blooming in almost full shade. Hosta rectifolia 'Fujibotan.' The hummingbirds love this hosta. I love the light, lavender-pink double blooms. Double impatiens - this was a cutting from one of last year's plants. The parent plant didn't look so great by spring - I guess they are truly annuals. Impatiens cuttings root easily though. This one was an experiment, and I plan to take more cuttings from it, and the lighter pinks too over the winter. Fuchsia 'Blackie' was cut back and overwintered in the basement. One of the mystery hostas. The foliage started out green and yellow, and has matured to a darker blue-green edge and lighter blue-green center variegation. It looks more green in the photo, more blue-green in person. I'm still not sure what variety it is. The other variegated mystery hosta has remained green and yellow, and is much smaller. No blooms on that one. Eupatorium 'Gateway,' (Joe Pye Weed,) with Rudbeckias 'herbstsonne' and 'goldsturm' in the background. Phlox paniculata 'David.' Suddenly this week there's a huge crop of slugs, and they're all over everything. Last year we had very few, and I saw only a few earlier this year. Our cool, rainy August is bringing them out in droves. Time to break out the pie tins and the cheap beer! Oxalis triangularis - overwintered in the basement. It went dormant almost as soon as I brought it in, and started growing again almost as soon as it went back outside in the spring. I have a few of them in mixed containers. I love the foliage and the blooms. Agastache ' Blue Fortune' - Anise Hyssop. Bees and hummingbirds love it. This large, stately plant is over three feet tall and covered with blooms even in almost full shade. I'm learning to love its pale, blue-gray blooms. They look bluer in the photo than they really are. Calamintha nepeta ssp. nepeta - teeny tiny blooms, and lots of them. Bees adore them. Phlox paniculata 'Laura.' The phlox , added to the garden late last summer, were pinched in June. As you can see, they aren't very tall. Cilantro blooms. This is the second sowing of cilantro, one of my favorite herbs. It has tiny, but beautiful flowers. To see more GBBD posts, please visit Carol at May Dreams Gardens. Not including the Mystery Hostas, this is one of three of the newest hostas in our garden. In its third summer, this hosta has three scapes, the tallest of which is easily four feet. This is Hosta rectifolia 'Fujibotan,' discovered growing wild on the slopes of Mount Fuji in Japan. Fujibotan refers to Mt. Fuji - botan means tree peony. It's a slow-growing hosta which, at maturity will have about 50 blooms on each four-foot scape. The first time we saw a hummingbird in the garden this year, the first thing it did is make a beeline for this bloom. The fuchsia was second on the hummingbird's list, followed by impatiens, and finally the not-so-blue agastache. The second time I saw the hummingbird, it went straight for my-favorite-hosta-this-week's blooms again, then to the fuchsia before it flew off. Other hostas are blooming in the garden, but this one seems to be preferred - by the hummingbird and me! Monica of Garden Faerie's Musings visited the Lurie Garden in downtown's Millennium Park on Sunday during her visit to Chicago a couple of weekends ago. She wrote about her visit on her MLive blog, Full Bloom. I haven't been to the Lurie Garden yet, or Millennium Park for that matter. Quite the homebody, I don't get out much! When I'm not working I spend as much time at home as possible, especially in my own garden. Well, this is sort of what I got. I didn't enhance this photo at all, yet the blue in the photo doesn't accurately depict the color of these blooms. They're really more the color of dirty dishwater. They don't look like this either. I took the first shot in the early morning, and this one later in the day, right after sunset. I've tried at several different times of day, and can't capture the dull color of these blooms on camera. Agastache 'Blue Fortune' is also know as Anise Hyssop. The foliage is very fragrant, and when crushed smells distinctly of anise. It's described on the tags that came with my three plants as follows: "Beautiful spikes of flowers attract hummingbirds and butterflies to your garden. Add the aromatic foliage to teas, salads, and drinks for a sweetly spicy flavor. Prized for is neat habit, long bloom season, and heat and drought tolerance." It's estimated height is 24-36", and recommended exposure is full sun. The anise hyssop here is planted in the shade. In it's second summer in our garden, it's over three feet tall and blooming profusely in spite of its less-than ideal light conditions. It's just the color of these flowers that bugs me. They're dull. Dull, dull, dull. Oh, and did I mention they're dull? There's nothing ruby, or giant, or purple about this coneflower. In this case, I enjoy this demure, pretty, pale pink flower, and I don't think the finches will care what color it was when they're enjoying it's delectable seeds. I'm thinking about moving the hyssop in the fall to a spot where there's a little more sun - in front of the 'Herbstsonne' Rudbeckia, and behind the 'Goldsturm.' The rudbeckias are planted in the sunniest part of the garden, (still at best part sun.) I wonder if moving the hyssop would perk up the color of the blooms. This fall I hope to move lots of things around in our garden. It's been more of a nursery than a garden as I've been collecting plants and experimenting with what and where to grow stuff in this dry, shady garden these first years I've lived here. I'm very pleased with how well the hyssop is growing and blooming, even in the shade. I love the scent of the foliage, the large size of the plants, and how well they tolerate the challenging conditions of growing in the shallow roots of our large maples. I like the long bloom time. It's just that dull bloom color that bugs me. Oddly enough, the coneflowers planted in almost full shade are blooming before the ones in part sun. I'm curious to see the buds on the sunnier coneflowers as they open, probably starting in the next few days. I wonder if they'll be brighter in color. I suspect they will. If so that will be even more motivation to move the hyssop and the 'Goldstrum' Rudbeckias. Do you grow Agastache 'Blue Fortune' in your garden? I'd love to know your opinion of this plant. I'm curious about the color of your blooms, and how that might correlate with how much sun they receive. Last Saturday I met Monica from Garden Fairie's Musings at the Chicago Botanical Garden in Glencoe, Illinois. It was wonderful to meet her, and we had a great time. The garden is set on 385 acres, and includes display gardens, wooded areas, prairies, and water features including lakes, streams, ponds, waterfalls, and fountains. Admission is free. Parking is $15.00 per vehicle, but is free to members. There are picnic areas as well as an indoor cafe, the Grille where you can order burgers and such and sit on the deck overlooking the gardens, and the Rose Terrace where you can relax with with a sandwich, salad, a refreshing beverage, or a nice, cold ice cream. The Chicago Botanical Garden is meticulously maintained, and houses approximately 2.3 million plants, All are documented, named, and mapped. We didn't see the entire garden in one visit, but that was ok, as we took our time and lingered in many of the places we especially enjoyed. I will definitely be going back to see more at another time. Of the displays we saw, these were some of my favorites. You can click on the pictures to enlarge them. Around lunchtime we were headed towards the Japanese Gardens, sited on 3 islands. We were getting hungry and tired, and didn't quite make it all the way there before deciding it was time to eat. Even from a distance though, they were beautiful, verdant, and tranquil. Most of the ponds featured water lilies, favorites of mine. The recently-renovated dwarf conifer garden was a beautiful combination of color and textures. There were several shady benches that provided the perfect invitation to sit a spell and take it all in. We gladly accepted the invitation! Another favorite spot of mine was the English Walled Garden. I loved it! Isn't it gorgeous? Made ya look! I was enjoying it so much, I forgot to take any pictures! This was another beautiful, shady area where we gladly accepted the invitation to sit on one of the many benches and relax, chat, and enjoy a few cool breezes and the gorgeous view. The next several shots are from the Prairie garden. This huge expanse is a re-creation of several different kinds of prairies once common in Illinois. Of everything we saw, I'd have to say the Prairie was my favorite. It was really gorgeous, colorful, and teeming with life, including native grasses, wildflowers, and birds. Monica, thanks again for the invitation to join you last Saturday. It was fantastic to meet you and spend the day getting to know you. Thanks for motivating me to get up to Glencoe to see the Botanic Garden for the first time since I was a kid. It won't be so long before I go up there again to see more of these beautiful gardens. What a wonderful way to spend the day! Things That Make You Go "Hmmmm. . . "
When my dear husband and I got back home from our evening out yesterday, our resident toad appeared to be trying to figure out how to get into the dishwasher. I could swear I heard him say as we walked into the kitchen from the garage "Hey, um, could someone open the door for me please? It's dark and wet in there, and since I'm here I'd like to make myself more comfortable." Now, you may be wondering the same thing we were by now, which was "How the heck did the toad get in the house?" The doors were locked, so we know he didn't just let himself in while we were gone. My husband is famous at work for practical jokes - all harmless, and all in good fun. And let me tell you, he's played some doosies! Let's just say if you work for him, you might want to keep your birthday confidential in case you don't want to come to work one day and find everything in your office wrapped in bubble wrap, or if you'd rather not come to work on your birthday and find farm animals in your office. So you can understand why for a moment I wondered. . . But I know him well enough to know he wouldn't bring a potentially salmonella-carrying creature into the kitchen to play with me, no matter how funny he might have thought that would be. And me, well, I'm so fond of this little guy I wouldn't intentionally cause him trauma or put him in danger like that. Not with George around, and not considering all the spaces he could hide, like behind the refrigerator, under the sofa, or any other of the multitude of places a frightened toad might go seeking protection. So how did our slug-eating buddy end up in our kitchen? We have no idea. We were out on the patio before leaving for the evening. Did he follow us, hopping up the two steps and in the back door? without us even noticing? Hmmmm. . . Did I bring any plants inside yesterday? He's been known to bury himself in the soil of my containers. No. . . Hmmmm . . . what about that container of mesquite chips I brought in a couple of days ago after my husband grilled? Well, that's a possibility, except I saw the toad outside the next evening, and the chips were already in. Besides, how would he have gotten up on our patio table and into the container, which is about a foot tall? We may never know how this little guy got into our kitchen. Thankfully he's not scared of me, and let me pick him up and bring him back outside. There you go little guy! Now you stay outside! We like you alot, but it's just not safe for you in the house. No, don't eat the worm - I don't want you to get filled up before you eat your 50-100 slugs for the night, ok? Oh, and remind me to wipe that splatter off the bottom of the dishwasher, will you?